Books, books, books, what would one do without them?! I am reviewing four books in particular, all with open ended art exploration for various age groups. I would like to give credit for Choxbox for her idea about cluster posts centered around a topic. Considering that art is in the air in many ST-ers and in this month many of us are sharing the art books we liked, cluster posts are more like a one-stop-resource, if I may say so. This book is O.L.D. First published in 1966, I unearthed it from our local library. This being an old book, I had to substitute some art materials in the book for what I had at home. For example I wasn't going to hunt for Indian ink and I substituted it with liquid food colors and a ink dropper. But the techniques are still largely relevant. Saunders has introduction to different art materials and brushes that are child friendly. There are different techniques like wet chalk painting, string painting, crayon resist, blotting etc. Each page comes alive with the vibrant abstract expressions of children. The book shows pictures of five or six-year-old children playing with paint. One thing I realized from thumbing through the book is that, in the sixties it might have been perfectly okay for a six year old to do art that looked like splattered paint with out disappointing an over bearing adult. Now a days, what is with this unsustainable push for children to be little geniuses and to produce something, I don’t understand. Kim Solga again explores open-ended techniques that produce abstract expressions. She talks about crumpling plastic wrap/aluminum foil/bubble wrap/leaves on to wet painting and let it dry over night to create texture on wet paint. This is perfect for the young three-year-old children. At home, we did back to back exploration where we did all the above on the same day. This kept my children interested for a good one-hour and the next day after the art pieces were ready to be handled, we talked about how different the textures were. Stemming from my interpretation of Montessori, I give the children only primary colors, unless they specifically ask for a secondary color or mix a secondary color themselves. So this gives us a great opportunity to talk about the new colors that are in their painting. The painting is only a day old, memories are fresh, so it is easy for us to discuss how different the blue + red = purple they created is different from the ready made purple and such. Some projects such as the introduction to Pointillism through dot painting are for the seven and eight year old children. But can be left open ended for a preschooler. I, in particular loved the concept of Kim’s “half-and-half-paintings”. It is for the older seven or eight year old child. In this technique, she pastes a post card sized photograph, like for example a giraffe, on paper. The giraffe has about an inch of its neck missing. The child has to observe the pattern and finish the picture, kind of like filling in the blanks. Arty Facts. 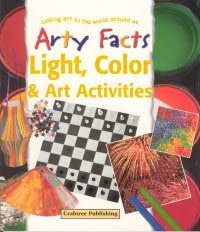 Light, Color and Art Activities. Linking art to the world around us. By Barbara Taylor. There are certain projects like making a kaleidoscope, creating positive pictures vs creating negative pictures, sculptures and mobiles that are suitable for an elementary school age child, but certain elements from each ‘project’ can be adapted for a preschool age child as well. I liked the way that book is true to its title, “linking art to the world around us”. The black and sliver foil fish mobile is inspired by a shoal of sardines. The book has the picture of a diver with a shoal of sardines in their characteristic circular motion with facts about the play of lights that is caused by the shoal on one side of the book, with instructions for the mobile on the other side of the book. There is a project inspired by the fireworks against the night sky and another inspired by the brightly-lit city with neon light and skyscrapers, that I found to be very inspiring. Black paper + glue + glitter = glee! What’s the big idea? Activities and adventures in abstract art. 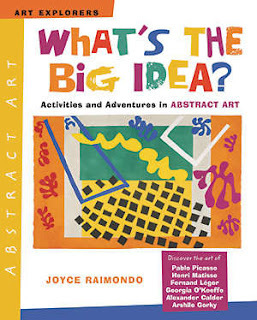 This book targets the older elementary school children and focuses only on abstract art. To be even more specific, the author discusses the styles of six artists and talks about how we can create our projects inspired by the masters. Joyce starts with Picasso’s cubism, talks about the elements of his art and provides suggestions to make ' faces with feelings'. She then wraps up Picasso session with photographs of child-made collages/models/sculptures made with a wide variety of material from paper and glue to lego blocks to strips of coiled paper arranged in a careful order. The other artists discussed are Matisse, Leger, O’Keeffe, Calder and Gorky. The book’s motto is “art as a springboard for expression” and manages to successfully accomplish it. Awesome utbt. 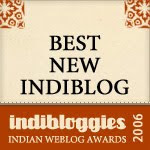 This is indeed a one-stop resource post! Nice art ideas. Another thing we tried was using tissue paper - you can scrunch it up and stick it on paper with extra glue, and then paint on it. Creates a lovely texture. This post makes me want to pull out all our art books and do a cluster post as well! Cool, thanks, utbt, we really could use all the ideas! I've found MaryAnn Kohl's book (First Art, Preschool Art and such) filled with ideas to try using just a few household items. @Chox: Thanks Chox. Tissue paper pasting, yes. The older one has done this at school. @Sheela: Thanks Sheela. MaryAnn Kohl comes highly recommended. I liked some of her ideas, but some like making paper(?) I wasn't quite kicked about. Also the b/w print kind of put me off. thanks for these references. will check them out. Thank you utbt for this resourceful post ! !